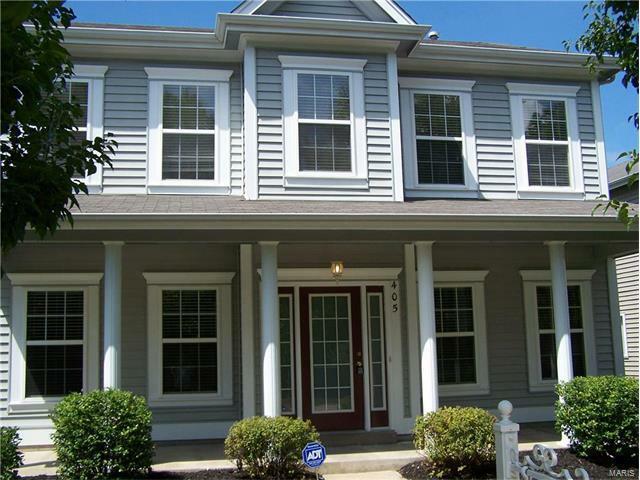 Located in the golf community of Winghaven, this 1.5 story has 4 Bedrms & 2.5 Baths. Large Front Porch w/views of common ground, welcomes you into Entry & Living rm w/wood floor, glass/peninsula gas fireplace, built-ins for entertainment or favorite display items & built-in speakers. Adjoining Dining area w/glass sliders to Patio, perfect entertainment layout. Kitchen features 42" cabinets, ceramic tile back splash & tons of counter space. Master Ste w/Full Bath & large Walk-in-Closet. Laundry & Powder Rm complete Main. All 3 Upstairs Bedrms are large & like Master have ceiling fans. There's a rm that can be a Family Rm/Office/Entertainment Rm since again there are built-in-speakers. Also a 20'x22' room off Bonus Rm & over 2 Car Garage for you. This is Move-In Ready, list of "Just Done Work" includes: Power Wash House Exterior & Patio, Fresh Paint inside & out where necessary, Professionally cleaned, including windows & blinds. Some new windows are scheduled to be installed. Hwy 40, Exit N at Winghaven Blvd, Right onto Phoenix Pkwy, straight thru Round-A-Bout, Left on Boardwalk Springs Place, Left on Covered Bridge Lane.